FAQ Friday: How Do I Add Students To My Teacher Account? Once you’ve created a teacher account, logged in, and created a class, you’ll be able to use your license codes to add students. There are two options for adding students. “Add Student Course” allows you to enroll students one at a time, and “Add Multiple Students” allows you to enroll an entire class in multiple courses with one process. 1. Add Student Course: To add one student at a time, click the “Add Student Course” link in the Teacher Menu. You will see the display below. First, select the course you want, then add the student license code, students name, grade level, language, and needs. Once you have finished entering the student course information, click on ‘Add Student’, and the student will be enrolled in your class. 2. Add Multiple Students: To add multiple students to your class at once, click on “Add Multiple Students” in the Teachers Menu. You will see the display below. In the left hand column under “Student Names (0)” you can type or paste the names of your students. This can be easily done from a student list spreadsheet or any other document where you can copy their names. Verify that the number in parentheses matches that of the number of students entered. Once you have added the students names in the left hand column, click the down arrow in the “Course (0)” field. You can select any and all courses to enroll your students. 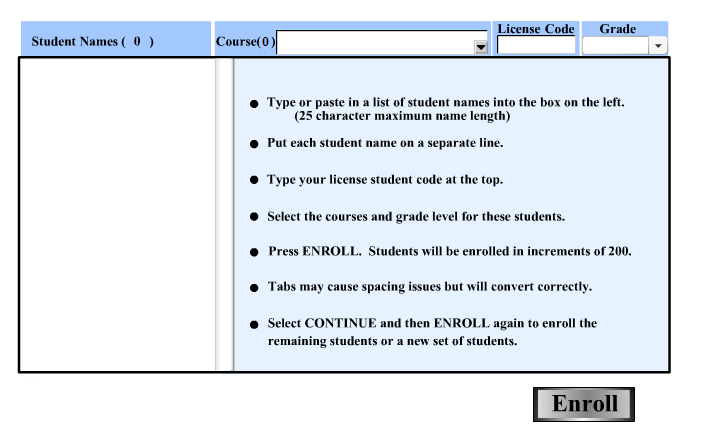 The final step is to add the student add code to the “License Code” box and designate a grade level. Click “Enroll” and all of the students and courses will be added to your class.